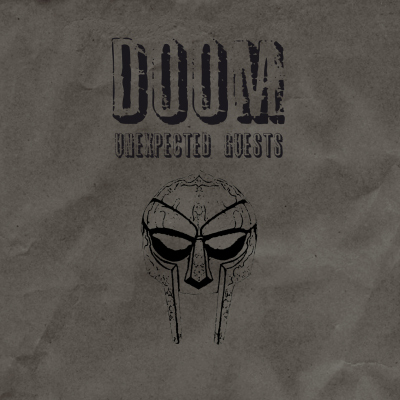 “DOOM is one of the most original and uncompromising voices in hip-hop. From his work in the 90’s with the seminal KMD to his legendary releases under a variety of aliases including MF Doom, Madvillain, King Geedorah, Viktor Vaughn, Dangerdoom & more, his prolific body of work has always valued artistic integrity and creativity over anything else. As numerous and varied as his albums are, DOOM also has a thick catalog of guest appearances, remixes, non-album tracks, & vinyl only singles. For the first time, Unexpected Guest presents many of these hard to find tracks as a mix CD, executed and overseen by the Super Villain himself. With a list of co-conspirators which includes marquee level names such as Talib Kweli, Ghostface & GZA as well as underground heroes Vast Aire, CountBass D & Kurius, the music on this disc highlights DOOM’s ever-present trademark wit and taste for raw and ominous beats. On “Trap Door,” he spits couplets like “No curse words / DOOM the worst church nerd verse heard” over a plucked bass and guitar line from producer Jake One that sounds like the funkiest spy movie soundtrack imaginable. “Sniper Elite” sees the emcee united with the late J Dilla, and is one of the many tracks featured that has yet to see an official CD release. The album will also feature a never before heard live version of DOOM’s classic “I Hear Voices” from the Operation Doomsday album.